The National Highway Traffic Safety Administration's (NHTSA) 5-Star Safety Ratings System gives buyers information about the crash and rollover protection a vehicle can be expected to provide in a frontal, side, or rollover accidents. You can find new cars' safety ratings posted on SaferCar.gov. This information is also listed on the vehicle's Monroney label (a window sticker that must be displayed on all new cars). The highest rating that a vehicle can be given is five stars. For maximum safety, look for one that has received a five-star rating in all of the categories. The National Highway Traffic Safety Administration is the government agency that conducts vehicle safety testing. During a frontal impact test, the vehicle is propelled straight ahead into a concrete barrier at a speed of 35 miles per hour (mph). The test is conducted in this way to simulate an accident where a car moving at that speed hits another one moving at 35 mph. During a side impact testing procedure, a sled weighing in at just over 3,000 lbs is run into the side portion of the vehicle being tested. The sled is outfitted with a bumper-type device and the tires on the sled are placed at an angle. This test is made to simulate what happens when a car is sideswiped by another vehicle while going through an intersection. Again, an accident where the vehicles are moving at 35 mph is simulated during the test. 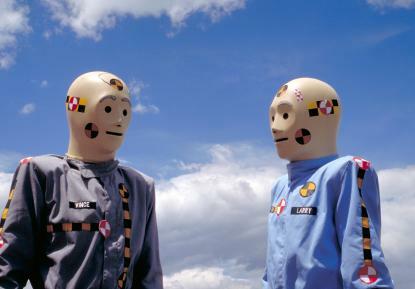 Before the collision is simulated, crash test dummies painted with different colors are placed in the test vehicle. The paint colors are placed on parts of the body that are most likely to be impacted during an accident. The face, skull, and knees are all painted different colors. The crash test dummies are placed in the vehicle and it is rigged up for the crash test. Various instruments are placed in the car and hooked up. Extra weight is added to the vehicle so that researchers will have test results similar to that of a fully-loaded vehicle being involved in an accident. One of the sensors used in the test measures the speed the car is traveling at shortly before the moment of impact. Cameras are used to record the crash, including ones placed under the vehicle. For a frontal impact crash test, the car is moved back from the barrier and positioned to crash into it. A pulley system pulls the vehicle down a runway toward it. The car hits the barrier at a measured rate of 35 mph and less than one second later, the car stops moving. In a frontal collision, researchers are looking to see whether the front portion of the vehicle was crushed during the accident. This is actually a good sign if it happens, since it means the vehicle is able to absorb the kinetic energy released as a result of the crash and stop it. Before buying a new car, make a point of checking the vehicle's 5-Star Safety Rating. You may always try to drive safely, but your life, and the lives of your family members, may depend on the choice you make. You will want to make sure you choose a car that is well designed and can provide a high level of protection in an accident.